GreenCircle Certification | Aaron Inc.
November 18, 2014, Leominster, MA – Aaron Industries is proud to announce that it has been awarded third-party certification from GreenCircle Certified, LLC, verifying the Recycled Content of its Post-Consumer and Post-Industrial blends of Polypropylene, Polystyrene and Polyethylene. 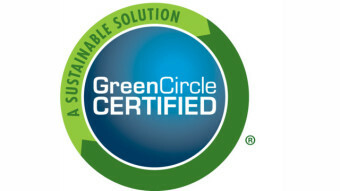 GreenCircle Certified, LLC (GreenCircle) is the leading provider of third-party certification of environmental claims. The recent certification has quantified and validated the recycled content of 19 of Aaron Industries’ thermoplastic custom compounds and resins. Through third-party certification, Aaron industries bolsters its position as a leader in recycled plastic innovation and one of the largest resin compounders in the Northeast. By meeting GreenCircle’s rigorous certification standards, Aaron Industries demonstrates that it is capable of, and consistently produces, a product that is in compliance with their recycled content claims. Recycling operations such as the ones found at Aaron Industries are reducing the need for virgin materials and reducing overall environmental impacts. As consumers become more informed, there is an increasing demand for sustainability and integrity from material suppliers like Aaron Industries. Third-party certification of sustainability claims is essential in maintaining credibility and meeting consumer demands. Established by Robert G. Tocci in 1983, Aaron Industries Corporation has become a leader in recycled plastic innovation, and is one of the largest resin compounders in the Northeast. Located in Leominster, Massachusetts, Aaron owns and operates a 100,000 sq. ft. production facility and maintains a state-of-the art shipping and receiving operation. Aaron supplies materials to a wide range of customers within the plastics industry and all of its recycled plastic products are backed by material certifications that meet strict quality standards. Every order is formulated to meet specific customer requirements and is tested in Aaron’s facility by certified lab professionals prior to shipment. Aaron’s vast inventory of materials provides the flexibility to produce the material at a substantial discount making a big difference in customers’ bottom-lines. The certifications offered by GreenCircle include: Carbon Footprint Reduction, Certified Energy Savings, Certified Environmental Facts (Multi-Attribute), Closed Loop Products, Life Cycle Assessment Optimized, Renewable Resource Content, Recyclable Material, Recycled Content, Renewable Energy Use, Sustainable Manufacturing Processes, and Waste Diversion from Landfill. GreenCircle provides verification and assurance to manufacturers, suppliers, regulators, and consumers that products labeled with the GreenCircle mark consistently meet our specific certification standards. GreenCircle is recognized by the USGBC Leadership in Energy and Environmental Design (LEED) and NAHB National Green Building Standard Program.